I am not going to lie, I chose to check this Kickstarter out for the art. Chris Collingwood is a professional artist that has put his time focusing on historical and military art. A lot of games seem to go for a hyper-realistic feel these days, if you want to go that direction, I say dive deep. 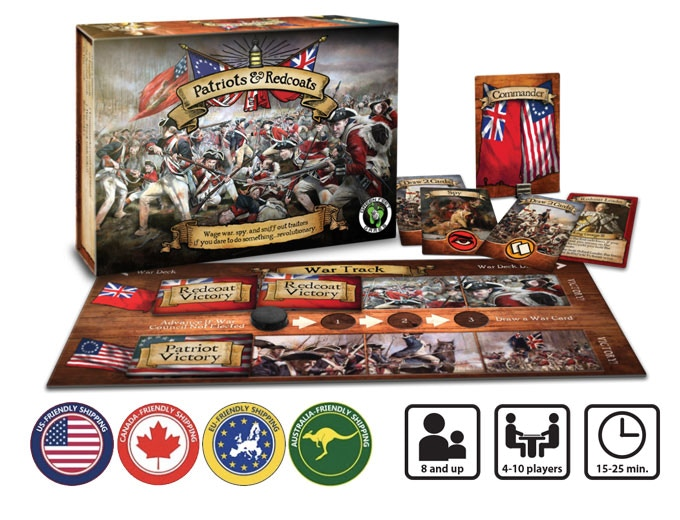 Green Feet Games did exactly that by pulling this artist in to focus on the American Revolution. The game itself looks pretty easy to grasp and play, a mix of Coup and the mafia game we played growing up. The one where everyone puts their head down while the mafia eliminates innocent townspeople - while a blundering detective inevitably fumbles through a contrived story from an evil narrator. I always enjoyed being the narrator in that game. The game calls for 4-10 people to play, which can definitely be a stretch to find. That being said, a 15-25 minute gameplay time should entice people who may still say that they "don't like board games"- they are probably talking about the horrific nights of family Monopoly that would take hours from their night that ended in a fight. As always readers, check out the campaign HERE and see if this is a game that you want to put your money behind! I get no financial bumps, this just looks like a fun game that I would like to try. Let me know of any other projects I should be keeping my eyes out for! What was the last project you backed? Share in the comments! Don't forget to check out other Kickstarter Spotlight posts HERE.